After over a year of beta testing, Valve is finally releasing Cold Stream. Fans of the four-player co-op zombie-slaughtering game Left 4 Dead 2 will finally see the official release of its Cold Stream DLC on July 24th. Cold Stream, which includes several campaigns adapted from the original game and an entirely community-made campaign, will hit the Xbox 360 and PC simultaneously. With the DLC comes the unleashing of all the Mutations that have been released so far, which were previously only available for limited periods. Valve first announced Cold Stream over a year ago, when it found a campaign being developed by a fan and decided to turn it into a group project. 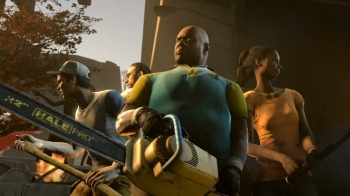 Valve pledged to focus entirely on gameplay, asking the Left 4 Dead 2 community to help out with suggestions for the new maps. Besides the titular "Cold Stream," the DLC also includes the four remaining campaigns from the original game: "Blood Harvest," "Crash Course," "Dead Air," and "Death Toll." Valve started releasing the beta DLC in chunks, occasionally challenging the community to help stress-test the beta maps. Fans jumped all over the challenges, first unlocking early release for the beta "Dead Air" campaign in July and then "Blood Harvest" in August. All of the beta DLC was eventually released and is still available for PC players to test. Valve hinted that there are several features in Cold Stream that have yet to be revealed, stating, "there are some other surprises and details we will give you later." The price of the DLC will hopefully be one of those details, as it's still unknown.